206 p., 18,5 x 25,5 cm. 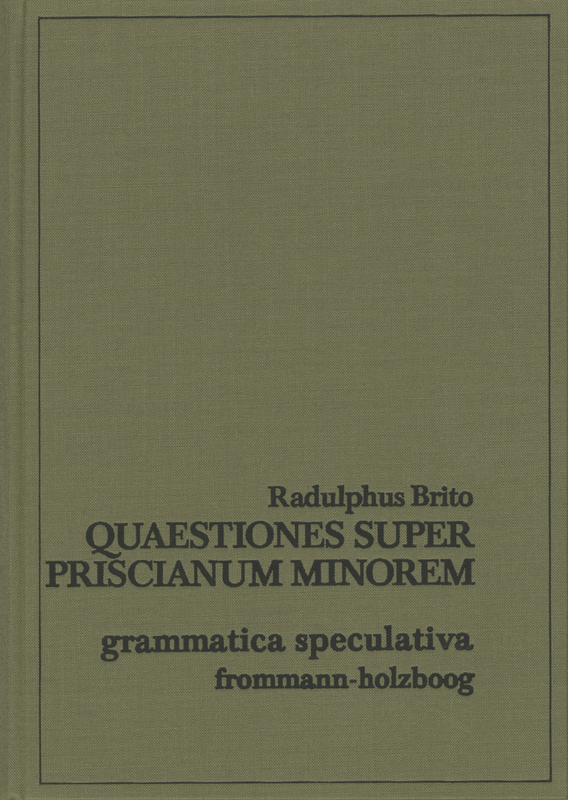 Among the speculative grammarians of the Middle Ages, there are two works which stand out as the most complete and thorough theoretical discussions of medieval linguistic theory: the ›Quaestiones super Priscianum maiorem‹ by Boethius de Dacia and – edited here for the first time - the ›Quaestiones super Priscianum minorem‹ by Radulphus Brito (around 1270–1320). In this fundamental work, which is full of astute observations about the theory of syntax and insightful syntactic analyses, Radulphus discusses the basic principles of the theory of a universal grammar. Based on this edition, it will be possible to assess the true value of medieval speculative grammar, the second significant branch of the medieval analysis of natural languages. The introduction deals with Radulphus’ position in the development of the medieval theory of meaning and some elements of his theory, which can be useful for the contemporary discussion on semantics.